When Size Matters… An explanation and complete guide for all the different Wine Bottle sizes and shapes, along with the history of the bottle shapes and all the most important details for all the large format wine bottle sizes used for Bordeaux wine, California wine, Rhone wine and other wines ranging from tiny bottles all the way up to the largest format we know of, which holds the equivalent of a whopping 40 bottles! Wines come in a myriad of styles from big, full bodied and fortified, to light and petite. Bordeaux wine and bottles for other wines are produced in an equally wide array of wine bottle sizes and shapes too. The main change in sizes and shapes for wine bottles began taking place in the early to mid 1700’s. The different wine bottle shapes and sizes started taking shape once it was discovered that cork could act as a sealing agent, which allowed the wines to age or at least not spoil. The next step in the evolution of wine bottle shapes and sizes came about when it was discovered that larger bottles not only looked better, they could also change the taste of a wine. This ability to change took place because the larger sized wine bottles allowed the wine to age and develop over longer periods of time than the standard glass bottles of the day. Larger wine bottle sizes are well suited to longer aging of Bordeaux wine or other wines. It is a fact that wine from larger format wine bottles age more slowly, and possibly even develop more complexity and nuances than wines from smaller wine bottle sizes. This is due to the smaller amount of air, or more accurately, (oxygen and sulfur dioxide) that resides between the cork and the wine. The surface to air ratio between the wine and the bottom of the cork is called ullage. The amount of ullage can either oxidize the wine, causing it to age prematurely, or develop at a slower pace of maturity. This takes because because the more air the surface of the wine is exposed to, the faster the wine is going to develop. That is why half bottles develop so much faster than large format bottles. This means that if you’re planning on buy a very old bottle of wine, or aging a wine for 30, 40, 50 or in some cases 100 years, the wine will most likely be better if it was aged in a large format bottle. Plus, large format wine bottles also look quite impressive on the dinner table! Very large format bottles have one other advantage and disadvantage. On the plus side, large format bottles, due to the thicker glass, and the volume of wine inside the bottle are less likely to experience temperature variations. Steady temperatures can help wine age more evenly. Very large format bottles might also require custom made corks that need to be individually cut and produced. Because that cork was made one at a time by a person, that exact size might not be perfect, which could lead to an imperfect seal and if that is the case, the wine will not age as well. Other wine bottle sizes like 1000 ml 500 ml and 250 ml are some of the unique wine bottle sizes available. It is important to know, some wine bottle sizes, usually larger formats are only used for the production of Champagne. In fact Champagne is famous for creating numerous wine bottle sizes and shaped used only for Champagne. The most unique Champagne bottle size earned the nickname of the Winston Churchill. The special bottle was made by Pol Roger for Winston Churchill and held exactly 20 ounces of Champagne, which was considered the perfect amount by Churchill for the morning. -Magnum: 1.5 Liters – 50 Ounces, (2 bottles) 14″ in height, 4 1/2” wide. 8-12 glasses of wine. -Old Bordeaux Jeroboam: Prior to 1978, the Jeroboam was 4.45 liters, 150 ounces – (5 bottles) and was often written as 444 CL. -Maximus: 130 Liters (184 bottles, 15 cases) The Maximus was created by Beringer out of their 2001 Reserve Cabernet Sauvignon for a charity auction. It is interesting to note that the Imperial and the Methuselah are both 6 Liters (8 bottles). The difference between the names depends on what is being bottled. Imperials are shaped like a standard wine bottle and are used for red or white wine. The Methuselah is usually reserved for Champagne or sparkling wine and comes in a sloped shoulder bottle, similar to a Burgundy bottle. Cylinder: 100ml: Used mostly for single, test tube shaped bottles with 3.3 ounces. You are seeing more of these bottles made for individual servings of Sauternes today. This tiny size is also used for some bottles of Essencia from the Tokaji region in Hungary. Chopine: 250ml – 1/3 bottle 250ml (1 ¼ glass) Used more often in France. Clavelin half: 310ml Used for Vin Juane, the yellow wine of the Jura region of France. Jennie: 500ml – This uncommon wine bottle size is used most often for sweet, dessert styled wines from Tokaji, Sauternes and its surrounding areas or Jerez. Clavelin Full: 620ml This seldom seen wine bottle size is used for Vin Juane, the yellow wine of the Jura region of France. Liter 1000ml This little wine bottle size holds the middle ground between a full bottle and magnum. It has been popularized in California by Grace Family Vineyards for their Cabernet Sauvignon. Marie Jeanne: 2.25 Liters This is equal to 3 standard bottles, or one magnum and one bottle. Port producers often refer to this unique bottle as a Tregnum or Tappit Hen bottle. It’s not just wine bottle sizes that vary widely. There are numerous different shapes that wine is often bottled in as well. When wine was first bottled, bottles were not standard in shape or size. The reason for this is, at the time, all wine bottles were manufactured one bottle at a time by glass blowers. 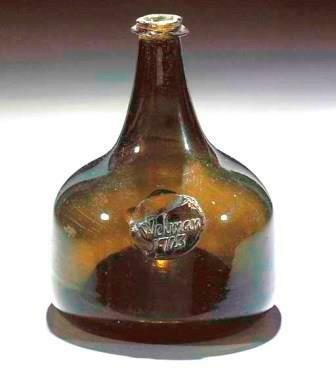 If you think today’s bottles look odd, check out the first glass bottles that were called onion shaped bottles, due to their round shape. These bottles were not easy to stack or cellar! The creation of the wine bottle as you would suspect coincides with the development of the cork which took place in the late 1600’s and began to get going in earnest by the start of the 18th century. Because the onion shaped bottles were made one at a time, the size varied with the most popular size being between 700ml and 800ml. Those sizes were both easy to carry, store and help the right amount of wine for 2 people at a dinner. Today, while there are a myriad of variances in bottle shapes, the three most widely used bottles are based on the following: The Bordeaux bottle with its tall shoulders, deep punt and straight sides. The sloped shoulders helps trap the sediment while the punt adds strength to the construction of the bottle. Bordeaux shaped bottles allow for ease in stacking and cellaring. The Bordeaux shaped wine bottle was created in France in the early 1700’s in France. Part of the reason the particular shaped bottle was easily adopted in Bordeaux is due to the fact that the bottle design was invented by Pierre Mitchell, who was also the owner of Chateau du Tertre in Margaux. The Burgundy bottle is wider and more pear shaped than the Bordeaux bottle. The Burgundy bottle has sloping shoulders with a deep punt. Today the pear bottle is the preferred shape by most produces of Pinot Noir and Chardonnay in countries all over the world. Variations of the Burgundy shaped bottle are also used in the Rhone Valley. The wines of Germany and Alsace prominently feature bottles with long necks and small punts. The unique, long, lanky shape was probably created at some point in the 1800’s. The elongated shape made them easy to store and stand out from other bottles in a wine merchants store. Interestingly, some German and Alsatian bottle vary in size from top to bottom, using various neck sizes, even though the amount of fluid inside the bottle remains the same. The color of the bottles can also vary widely, ranging from clear to various shades of green, brown, rust and blue. Champagne bottles were created to enhance both the beauty of the bottle shape and for practical reasons. Practicality comes into play in Champagne because the bottles needed to be stronger, due to the pressures coming from the effervescence in Champagne. While Champagne bottles are obviously related to the pear shaped, Burgundy bottle, they are also different. Champagne bottles are usually slightly larger, heavier and feature larger, deeper punts for the reasons we mentioned. The bottles were invented at the same time that winemakers discovered how to produce Champagne, in 1662. Several Champagne producers have created their own, unique, patented Champagne bottle shapes to help their product stand out including Krug, Dom Perignon, Feuillatte Palmes d’Or, Cristal, Laurent Perrier and others. The most popular wine bottle size and shape today is the standard Bordeaux shaped bottle used for most wines. The standard bottle mirrors the common 750ml Bordeaux bottle. However there are slight variances that take place in the Bordeaux region as well as in other countries. Chateau Haut Brion has its own, unique antique shaped bottle with its trade marked sloping shoulders. A different antique shaped bottle is used for Chateau Pavie. From time to time, some chateaux use thicker, slightly larger bottles, for example Pontet Canet in Pauillac. A few wine makers package their wine in taller bottles with longer necks like Magrez Fombrauge in St. Emilion. While most of the smaller Bordeaux bottles holding 375ml are the same standard shape, some producers of sweet, white Bordeaux wine package their product in longer shaped, half bottles. Bordeaux is not the only French appellation that markets wine in bottles with shaped variances. In the Southern Rhone Valley, some Chateauneuf du Pape producers use short, squat shaped bottles, for example Gardine uses a unique short, squat shaped bottle. It’s not just European producers that use unique packaging. The top estates in the Napa Valley often use a wide variety of shapes and sizes to showcase their wine. Some bottles are massive in weight and size for Cabernet Sauvignon. Others use extremely long necks. A few producers prefer shorter, wide bottles. Sine Qua Non, the top producer of Rhone varietals in North America uses a different bottle in shape and size for every vintage! A small amount of California winemakers have even taken to packaging their wine in square shaped bottles, making them quite easy to stack and store. In Burgundy, the shape most commonly used is a bottle with sloped shoulders and a small punt, which is now almost always referred to as a Burgundy shaped bottle. German and Alsatian wine producers favor extremely tall bottles with long necks and tiny or non-existent punts. Italian producers utilize a myriad of wine bottle sizes and shapes for their wines, especially for lower priced bottles that are marked by their round, shape and are from time to time wrapped in straw. Chianti bottles were historically wrapped in straw not for decorative purposes, but to protect the round, shaped bottles during shipping. Port and Madeira favors a round, almost cylinder bottle shape that was designed for long term cellaring that is quite easy to stack, store and transport.